The Flux:: Pure Analyzer System is a network-driven modular RTA-system providing an extensive range of analyzer options for any imaginable audio analysis and measurement applications. Sample grabber is a standard DAW plug-in available in all common formats (VST, AU, RTAS and TDM) that acquires the source and response signals and sends the signal through the network using the ZeroConf/Apple Bonjour protocol. You can insert as many instances of Sample grabber plug-ins as required, on the same DAW, different DAWs, and even different computers altogether, and the Sample grabber also support surround configurations. The network configuration setup for the Pure Analyzer System is entirely automatic and transparent to the user. The audio transport requires approximately 1.4Mbps for each channel at a sample rate of 44.1kHz, so a properly configured standard Ethernet 100Mbps network should be more than sufficient to handle most cases. A 5.1 configuration at 96kHz demands a little less than 20Mbps. Naturally these requirements do not apply when using both Sample grabber and analyzer on the same hardware. The foundation of the Pure Analyzer System is a standalone application, Pure Analyzer Essential, which can be extended with modules for Live, Metering/Loudness and Surround analysis, performing the graphic analysis rendering using a GPU-efficient 2D/3D graphic engine. The engine is based on the OpenGL standard optimizing the audio-to-visual experience utilizing the GPU on the built in graphics card. The Pure Analyzer Essential application receives the sample feeds from the Sample grabber and analyzes them in real time. The Pure Analyzer provides the option to receive data from several different Sample grabber plug-ins on the network, and analyze the received data in parallel by selecting the actual corresponding Sample grabber to be the current source for the analysis with a simple button click. In addition to this, the input streams from the physical ASIO/Core Audio I/O can also be selected as the current source for the analysis in the same simplistic fashion. As a complement to the Pure Analyzer Essential, three different add-on modules, all providing specific tools for their actual field of usage, are currently available. 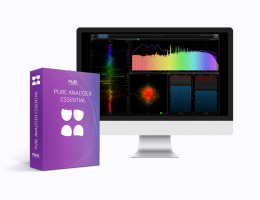 In order to use any of the add-on modules, the Pure Analyzer Essential is required. Pure Analyzer is built around Flux::'s new 2D/3D efficient graphic engine, which employs full GPU-acceleration utilizing an OpenGL-compliant graphics card. In order to experience the outstanding graphical response in Pure Analyzer and to fully take advantage of the software's analysis capabilities, using a modern nVidia or ATI Radeon graphics card is recommended. Older, and other less efficient graphics cards do not have the required performance and specifications, and will offload too much work to the CPU. GPU: AMD/ATI Radeon or nVidia video-card. Intel integrated graphics are not powerful enough and should be avoided.